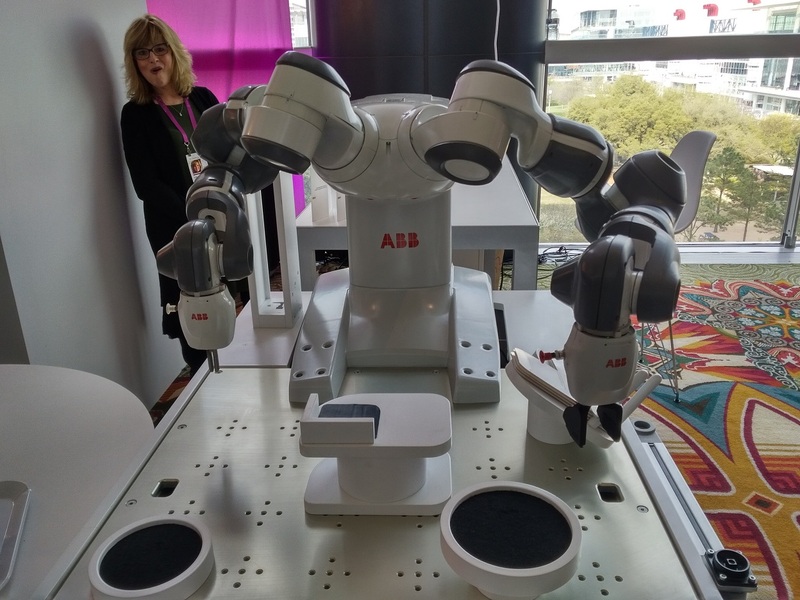 Technology, especially AI and robotics, were hot topics at the recently concluded IHS CERAWeek in Houston, Texas, US. They simply had to be, with a succession of ‘Big Oil’ and utility bosses stressing on the need for a more efficient optimised energy industry. The annual event itself, now past its 37th year and counting, also saw its tech floor and space grow bigger in addition to the dialogues that took place. In the midst of it all, robotics and engineering giant ABB’s boss Ulrich Spiesshofer insisted that the Oilholic should not leave Houston without paying YuMi a visit. 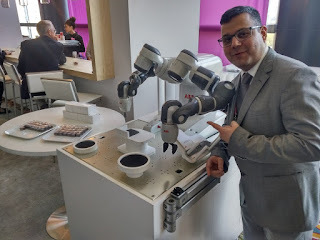 That would be the company’s small-parts assembly robot first introduced to the industrials market in 2015; and has been making waves ever since. It has vowed US President Barack Obama, German Chancellor Angela Merkel, and even conducted Italian tenor Andrea Bocelli and the Lucca Philharmonic Orchestra at the Teatro Verdi in Pisa, Italy. According to ABB North America spokesperson Chris Shigas, the speed you see in the video is only 50% of what YuMi is capable of. The company describes it as a ‘co-bot’. YuMi weighs 38kgs and is the size of a small human being. It can [and does], operate without a protective cage with in-built health and safety features designed for it to work alongside human co-workers. The thought process and platform collectively give YuMi its name - “you and me” working together to create “endless possibilities,” as ABB suggests. In fact, the Swiss chocolate nibbles you see YuMi pick and pack are pretty light compared to the 500 gram payload it can currently handle. Shigas said that thanks to its compactness, YuMi can be easily integrated into existing assembly lines thereby increasing productivity. What created the real buzz for oil and gas folks at CERA Week was the fact that YuMi features lead-through programming, which, in simple terms, does away with the need for specialised training for operators. That opens up endless future possibilities for a plethora of industries. Well, that’s all for the moment folks! But before the Oilholic takes your leave, a photograph with YuMi was in order for a keepsake, given it has rubbed shoulders with presidents and chancellors, and might soon be coming to a facility near you. We both also seem to be in matching attire, more by coincidence than by design, in this blogger's case at least! Keep reading, keep it ‘crude’! © Gaurav Sharma 2018. Photo 1: ABB's YuMi at IHS CERA Week 2018. Photo 2: The Oilholic with YuMi. Video: YuMi packs Swiss chocolates © Gaurav Sharma March, 2018. Frackers on the side of geopolitical angels?